The Caribbean is famous for its beaches. So much so that it has some of the world’s best and most pristine white sandy beaches caressing its gorgeous shores. But what if you could stay on one of worlds best beaches in one of the world’s best beachfront Caribbean villas? Well, I am delighted to let you know it’s possible and in fact, we have handpicked the most exclusive locations for you. And even though at first glance they may seem expensive, when you break it down per room or by occupancy the prices for luxury vacation rentals often compare much more favourably to some of the five-star hotels in the region. And of course, you get so much more for your buck. Much more space, the privacy to do what you want when you want, and you won’t have to compete with your fellow vacationers for the best spot on the beach or for some beach beds because the beachfront and the beds are all yours for your entire stay! And the staff are all yours too. In these beachfront Caribbean Rentals, there will be no desperate waving of hands trying to get the waiter to give you your cheque or feelings of neglect because you are put at the back of the restaurant instead of beside the view. The view is all yours, and it’s always a seafront one!! It doesn’t get better than this. If you think you won’t get all the bells and whistles that come with a hotel, you can forget that notion because most of these beachfront Caribbean villas have chefs, butlers, pools, gyms and spas. You will be able to walk, jog, swim, snorkel, scuba dive and fish just steps away from your door. All you have to do is settle into your secluded paradise as you unwind, relax and enjoy the beauty and the gorgeous Caribbean sun. Here is our selection of luxury Villas on some of the best Caribbean Beaches which includes Grace Bay Beach in Turks and Caicos, Seven Mile Beach in Grand Cayman, Meads Bay in Anguilla, Flamand’s Beach in St Barts and many more. 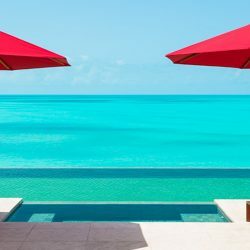 Picking our favourite villa in Turks and Caicos was extremely hard. We have over 80 Beachfront Caribbean rentals to choose from in our portfolio, and they are all stunning! But Hawksbill Villa on Grace Bay is particularly special. It is an exquisite 8-bedroom beachfront mansion set in over 4 acres of its own land and has very extensive beach frontage on Grace Bay. 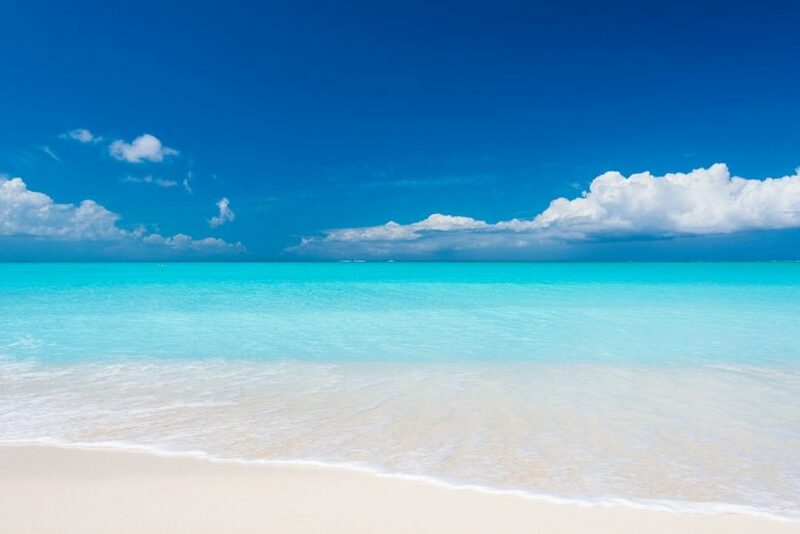 Grace Bay Beach has been voted the worlds best beach many times and by many different reliable sources such as the Huffington Post. Whilst most beach front villa rentals are set back from the beach, or located above the beach, the Hawksbill terrace and pool area are sitting right on the beach, so you cannot physically get any closer. The views of the gorgeous crystal-clear turquoise waters abound from all corners of the house and are captivating from the slightly elevated views of the Great room and master bedroom. A stay at Hawksbill comes complete with a spectacular free-form swimming pool, an impressive cinema room, a media room full of games, a floodlit tennis court, a mini basketball court and a fully equipped gymnasium and all the non-motorized waters sports facilities known to man! Last but not least there is a full team of professionals including a Butler, Property Manager, Chef, Housekeeper and Groundman to look after and anticipate your every need. 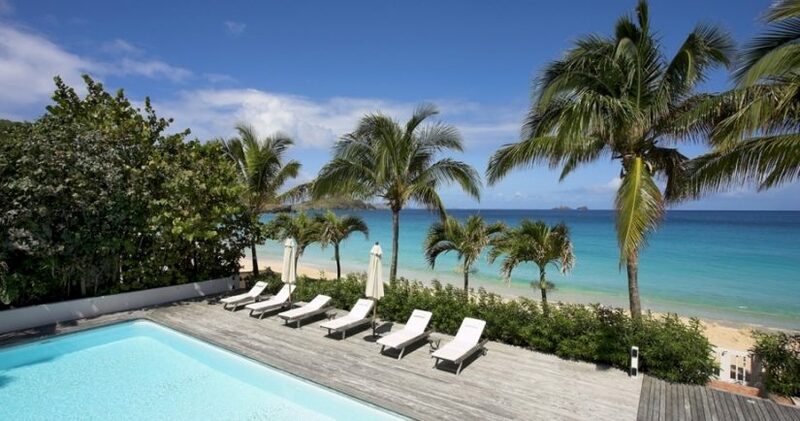 Villa Ella in St Barts is definitely one of our favourite Beachfront Caribbean Villas. The location on Flamand’s Beach is utterly divine. You are steps from the sea and almost next door to the gorgeous Cheval Blanc Isle de France Hotel. You get the best of both worlds. The privacy and space of your own beautiful home and you can also stroll along anytime to the restaurant and bar at the hotel. Another one of the islands best restaurants at the Taiwana Hotel is also a short stroll along the beach from Villa Ella. 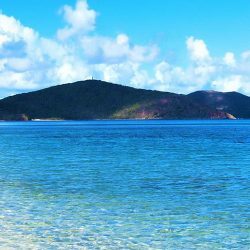 One of the wonderful delights of staying in this elegant beachfront Caribbean villas is you also get to visit my personal favourite beach in the world called Colombier beach. It is a short 30-minute hike from the villa along a gorgeous cliff top with spectacular views. The only way to get to Colombier Beach is by foot or boat, so it is always virtually deserted. 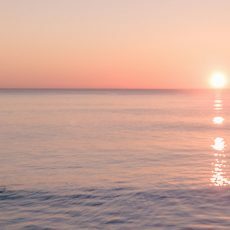 If you go early enough in the morning, you will have a piece of paradise all to yourself. Villa Ella has 8 beautiful bedrooms many of which embrace the panoramic sea views. The décor of the villa is exquisite yet encompasses a simplistic touch. There is a large private pool and an expansive outdoor terrace where you can enjoy the view, have a barbeque, spend time with loved ones or even just to read your favorite book. It is the type of place where the pressures of life will melt away under the sun and where you can instantly relax, enjoying your exclusive family vacation. 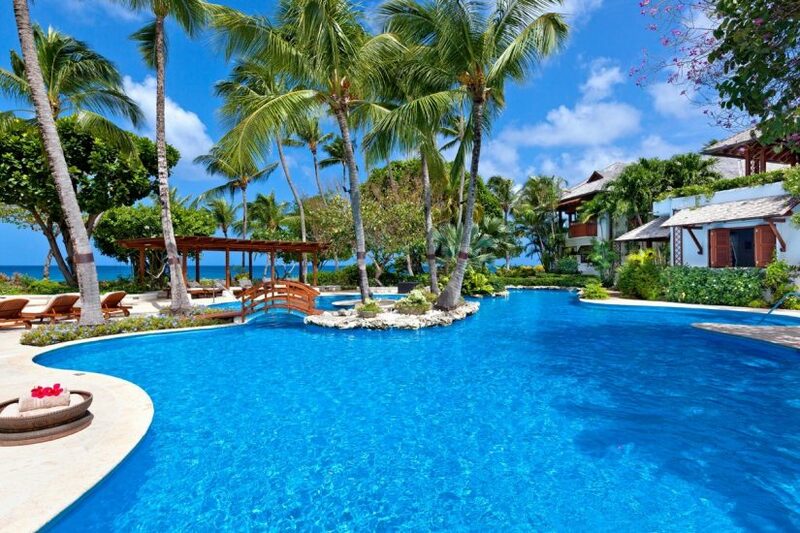 Greensleeves in Barbados is a unique beachfront Caribbean Rentals as it located on not one but two of the best beaches on the island. This exquisite Barbados Villa sits on a slightly elevated land promontory or headland. To the north is the beautiful Gibbs beach which is one of the quietest beaches on the island and to the south is Reeds Bay which is one of our favorite beaches. Greensleeves holds its vibrant character for the fact that half the house is in the Parish of Saint James and the other is in the parish of Saint Peter! Greensleeves is a virtual haven of tropical peace and beauty. You enter this outstanding villa via huge Mongolian Temple doors. An intricately crafted wooden bridge carries you over a gorgeous Japanese water garden that is brimming with colourful flowers and Koi fish. The beauty is offset by the sounds of hummingbirds and the whistling of the tree frogs. There are 9 bedrooms in total, and the Master is only available on full occupancy, but I highly recommend you bring enough to fill this gorgeous house so that you get to stay in the master suite. It is the most beautiful I have ever come across with views that are breathtaking. This incredible house comes complete with over 10 acres of parkland, a large free-form swimming pool with swim up bar, a tennis court, a cinema room and a team of professional staff who are as friendly as they are efficient. All you must do is have the vacation of a lifetime. Fortlands Point is one of the only Caribbean beachfront rentals that has its own private cove. 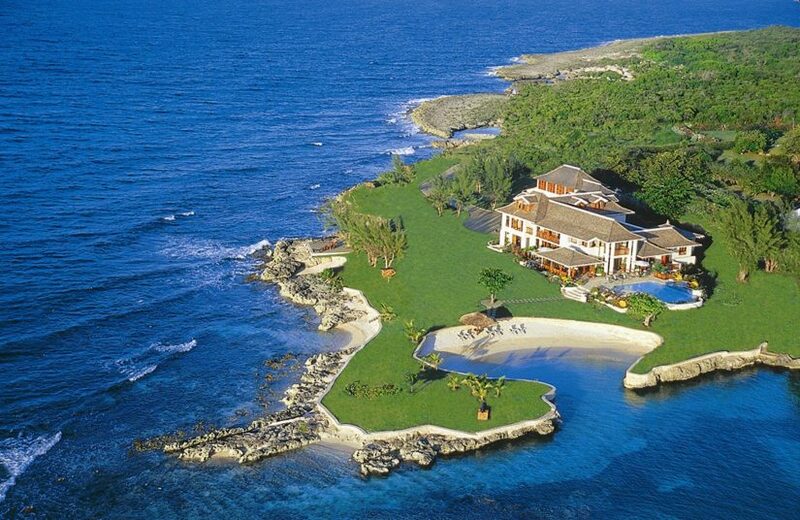 It is also one of the world’s most exquisite 7-bedroom beachfront home. This lavish vacation rental sits on its own private promontory of land and consequently has sea views from three sides of the house. Of course, the décor is exquisite, and the gardens and private pool area are equally luxurious, but there are two things that make Fortlands Point extra special. The first is the fact that it has its own private cove called Discovery Cove. The sand is powdery soft with a white sugar fine feel, and the waters are crystal clear and calm. The second is the team of professionals that look after you during your stay, who are among the best in the Caribbean. You will have your own private Chef, Butler, Housekeeper and laundress to ensure your every whim is cared for. Every single one of our customers returning from a stay at Fortlands Point always mentions the staff, and it is also for this reason the villa gets to see its guest more than once. Amenities of the home include access to 3 beaches, complimentary non-motorized water sports, a fitness room, squash court, a putting green, an infinity edge swimming pool and a hot tub. It is no wonder that Fortlands point was named as “One of the best Villas in the World” by Islands Magazine. Lazy Lizard is one of the most unique beachfront villas in the Caribbean. Imagine the serene beauty of a Thai style mansion and combine it with the stunning beauty of the private paradise island of Jumby Bay, and you have Lazy Lizard Villa. 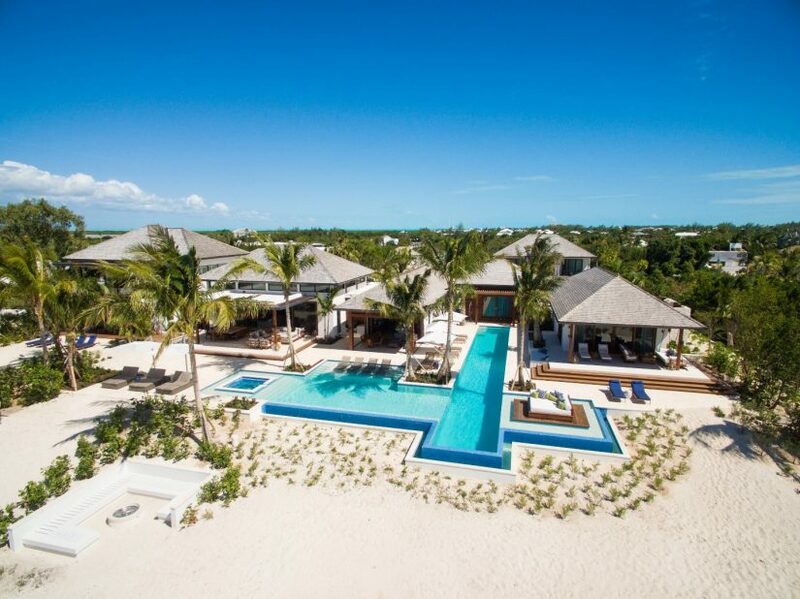 This exquisite villa is located on Jumby Bay Island which is one of the world’s most exclusive private islands located just 5 minutes by boat off the shores of the mainland of Antigua. You share the island with a small number of equally gorgeous properties and one of the most exclusive hotels on the planet. These hotels are run by one of the world’s most sought-after hotel companies called the Oetker Collection. Lazy Lizard has been designed in Thai style pavilions which ensures the utmost privacy for its occupants. Each of the pavilions surrounds one of the most beautiful free-form swimming pools that we have ever come across and are set in stunning sweet-smelling tropical gardens. The villa itself comprises over 18,000 square feet of living space. Lazy Lizard comes with a fully equipped fitness centre, a media room, a tennis court and a team of well-trained professionals to anticipate you’re every need. There is a huge Buddha at the entrance to the property which sets the scene for you to take a breath, enjoy the moment and relax for your entire stay in paradise. Last but not least, one of the wonderful aspects of any stay at Lazy Lizards is you have all the space and luxury for your own private home yet all the facilities including all your food and drinks at the hotel are included in your rate. So you can choose to eat at home or choose to go to one of the amazing restaurants that are part of the Jumby Bay Resort Antigua. It simply does not get better than this. Kishti on Meads is not only the most beautiful villas in Anguilla, but it is also located on the prestigious beach, Meads Bay. Meads Bay Beach is a picture postcard perfect stretch of powdery white sands and crystal clear calm turquoise waters. Kishti East is a beachfront villa in the Caribbean with 6 bedrooms and can be rented with Kishti West to make a total of 12 bedrooms. It is one of the perfect Caribbean beachfront rentals for a special occasion or a multi-generational gathering. One of the best aspects of a stay at Kishti is the villa provides a huge amount of privacy, yet it is still walking distance to delicious restaurants, bars and beach cafes, some of the best things to do in Anguilla. The villa comes complete with a gorgeous infinity pool. A hot tub, a rooftop garden, a fully equipped gymnasium, a home theatre and a team of professionals to look after your every need. 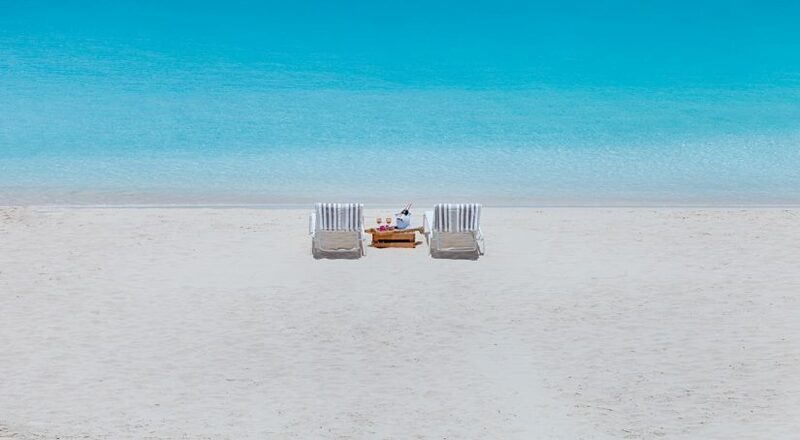 Kishti Villas on Meads Bay offer the ultimate in pampering and luxury on one of the world’s best beaches. 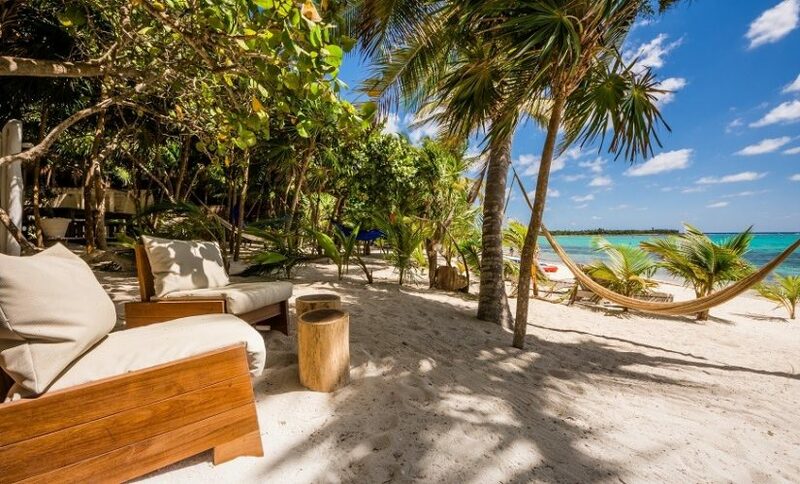 La Semilla is a paradise location to completely switch off and unwind from the real world with its lush, green mangrove jungle surrounding and secluded quiet beach of Soliman Bay. Designed with relaxation and rejuvenation in mind, it is a favourite spot for a family or group of friends to feel nurtured and pampered for the entire vacation. La Semilla is a villa that will revive your body and soul with its seamless bond between luxury and nature. You will be welcomed by a palm-lined courtyard, you will fall in love with its rustic-chic interior, and you will relax in its tranquil oceanfront garden with infinity pool, lounging and dining areas. On top of this, you will have a wonderful cook who prepares three meals each day, our VIP concierge service that can help arrange activities, a housekeeper and a gardener. We have everything covered to make sure your vacation is purely “switch-off mode”! The villa is perched on the most stunning stretch of beachfront with amazing views of the Caribbean ocean that you can enjoy from your own private terraces adjacent to your bedroom. Why not take your complimentary kayaks out on a Caribbean Sea adventure and be sure to use your bikes to discover the Tulum ruins just down the road? La Semilla is a perfect combination of privacy, luxury and nature and is the ideal place to immerse yourself in the natural beauty of Mexico. 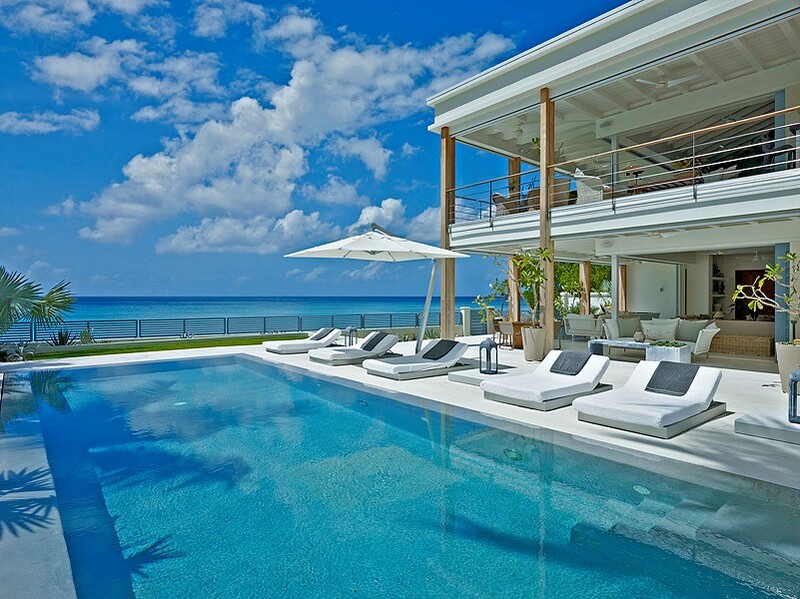 A stunning contemporary beachfront villa with breathtaking sea-views. The Dream Barbados really has the wow factor, from the moment you arrive you’ll be blown away by the sense of space, cool open plan interior with tonnes of indoor-outdoor living space. The master bedroom is particularly spectacular! Guests here are in for a treat with every need tended to by the wonderful villa team including chef, housekeepers, butlers and laundress. The stretch of beach here is quite secluded and feels very private. Guests will enjoy swimming in the crystal-clear water and snorkeling just to the left of the villa. Tortuga Bay Punta Cana Resort and Club is one of the most luxurious accommodations in the Caribbean. The only AAA Five-Diamond awarded property in the Dominican Republic, the service provided at this exclusive resort is outstanding. The refined Tortuga Bay experience starts from the moment you land in Punta Cana Airport. 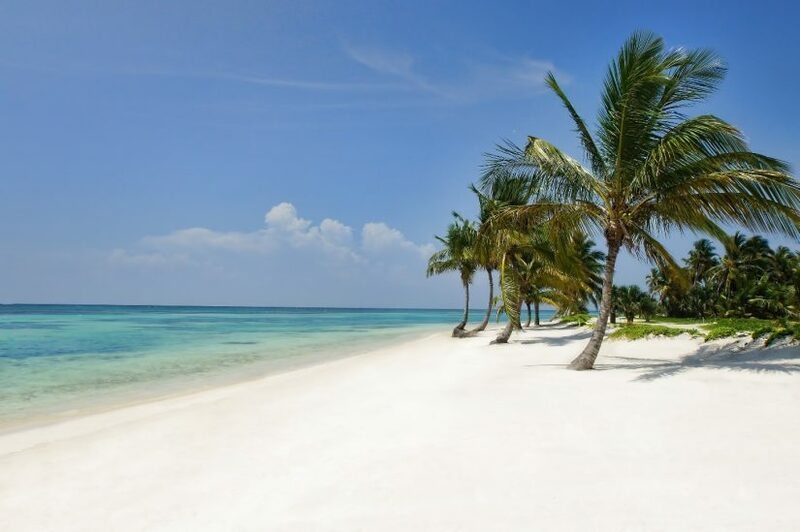 The resort provides an exclusive VIP service that meets you on arrival and brings you to your private Tortuga Bay chauffer driven car, where you will be served refreshments and cold towels for your short journey to the resort. On arrival at the resort, you will be met by the staff and will experience the private check-in service with your personal concierge in the comfort of your impeccably designed villa. This boutique hotel includes 13 luxurious villas from 1-bedroom junior suites to 4-bedroom villas, all offering privacy, unrivalled luxury and an exclusive world-class 24hr room service. Designed by Oscar De La Renta, the villas are inspired by the rich, indigenous culture which provides the authentic Dominican Experience, each elegantly furnished with local materials. The beautiful bright yellow painted villas are situated along to the most incredible white sandy private beach, have beautiful calm crystal blue waters and one of the most beautiful ocean sunrises in the Caribbean which would literally take your breath away. All the rooms include the finest linens, separate kitchenettes and beautiful coralline stone bathrooms offering ultimate luxury. The Tortuga Bays luxury service extends to the incredible dining experience where you can dine in one of the numerous award-winning three and four diamond restaurants which are run by world-class chefs. The resort has a total of 6 eateries with a diverse selection of cuisine and each with a comfortable and inviting ambience where you can enjoy truly mouth-watering and freshly prepared cuisine. The resort also proudly hosts Oscar De La Renta’s first resort boutique where guests can shop the elegant and timeless collections which also includes home décor and beauty and the incredible award-winning six senses spa. Tortuga Bay is unrivalled and the ultimate luxury Caribbean destination. Westshore is a real hidden gem on the exclusive West coast of Barbados, just a short drive from the very chic Holetown. The villa has been recently renovated and has a cool beachy vibe. It’s a true beachfront villa, so much so you almost feel you’re on the deck of a boat while relaxing on the terraces. This stunning home is on two levels with a living room and two en-suite bedrooms on each level. The water here is beautifully turquoise, and our guests love swimming and snorkelling along these crisp crystallized waters. There’s a private plunge pool on the terrace to keep you cool in the beautiful Bajan sunshine. Westshore comes with your own personal cook and housekeeper, so you can enjoy delicious meals overlooking the water. There’s nowhere nicer to enjoy the stunning sunsets. This luxurious villa is part of The Palms resort in Costa Rica. Nestled on the white sandy shore of Playa Flamingo. When you think about a tropical beach with blue crystal waters and sparkling white sand Playa Flamingo is what you see in your mind’s eye. I love this villa as the views are unforgettable. Ocean views that give way to lush tropical forest and mountain peaks, you can sit back and relax in an oasis of peace and paradise. If you are more the adventurous type, the villa includes boogie boards, snorkelling gear, surfboards and kayaks for you to explore the ocean. Just 15 minutes south, you can explore the wonders of Costa Rica national parks and nature preserves. The short, private transfer of one hour from Liberia International airport is another big plus. 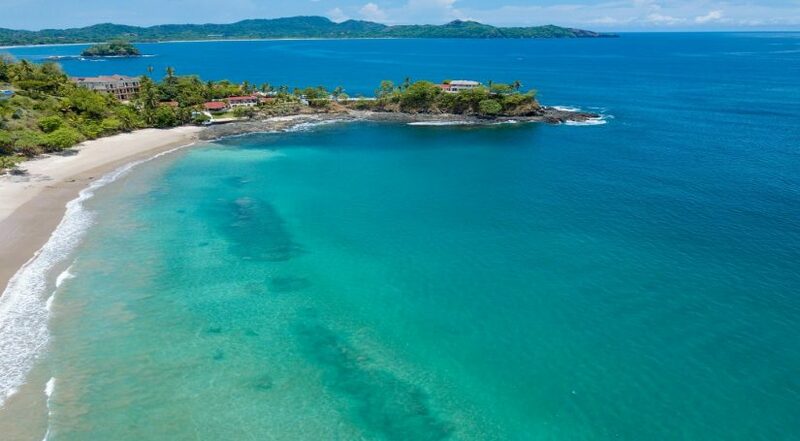 This is the kind of place where in the same day you can see howler monkeys, sloths, rappel down a waterfall, soak in a hot spring and be lulled to sleep at the Beautiful Palms 28 by the oceans lapping waves. This incredibly opulent vacation rental is surrounded by sweet smelling tropical gardens and has gorgeous views of the ocean and beach. 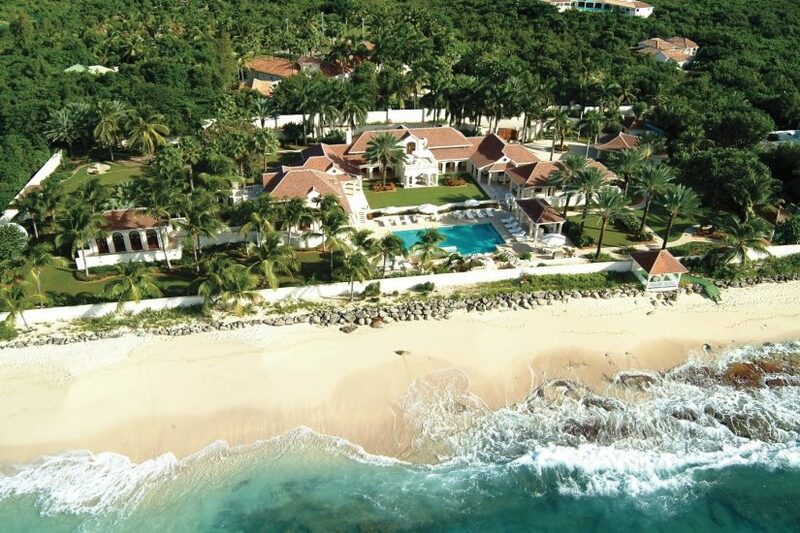 It has one of the largest beach frontages for a private property in the Caribbean. As you might imagine, its owner expects the very best, and that is what anyone lucky enough to stay in this palace gets. There is a fully equipped media room, a tennis court, a state-of-the-art security system, a fully equipped gym, a barbeque and a fabulous swimming pool that is located right on the edge of the beach. 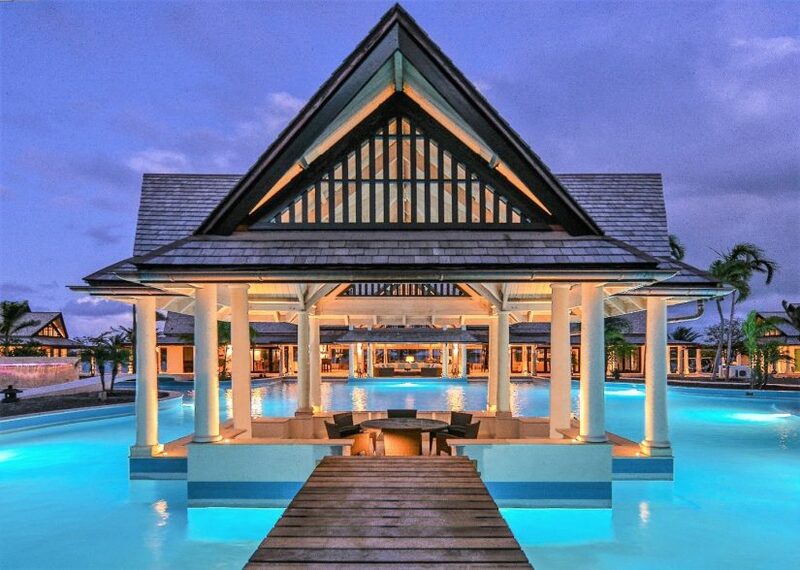 My team and I at Exceptional Villas are lucky enough to travel all over this wonderful planet of ours. 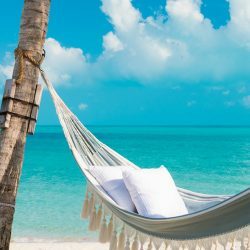 We get to see all the best Caribbean Beachfront Vacation Rentals and have handpicked our favourites one. But we love to hear from our readers and welcome your comments and input. We look forward to hearing from you and we look forward to welcoming you to an exceptional experience.